Lake Houston- like most Texas lakes has been getting a decent amount of rain keeping the lake off color and the upper creeks and rivers running high. But all this water is a great thing and white bass, crappie and yellow bass are all staging to spawn. Lots of males so far with a few females in the mix. This warm couple of days should get em going, just pick your windows and keep an eye of flows and water temps. Lake Somerville- White bass, hybrids and crappie have all been playing. Weve had several days of none stop action but if you weren't in the right spot only a few hand an hour. The dam has been flowing while fishing is doable were all ready for it to drop. Check those tooth patches also some of those Sunshine bass are the size of keeper white bass. Urban Carping- its tough this time of year but pick your days and the Grassers are super aggressive. Little bit of dry fly action lately on caddis and stimulator patterns but olive brasshawks and similar nymphs have been working also. Look for flows 250cfs and under and warmer days(sun is always preferred.) Buffalo have also been on the flats with the occasional playing along. Other than that lots of mullet with a random tilapia or two. Have had a clean shot at a common or koi in two months on the concrete but expect that to change in the next month or two. Pre and Post spawn bite can be awesome March and April can be ridiculous with schools of grassers and commons doing there thing. Private water Lake- while a little slower this last month expect this next couple of weeks to start turning on and the bass will start pre spawning probably mid March. Bluegill luckily bite all year and have been keeping us busy when the bass aren't playing. Lake Conroe- White bass and crappie spawn has kicked off. 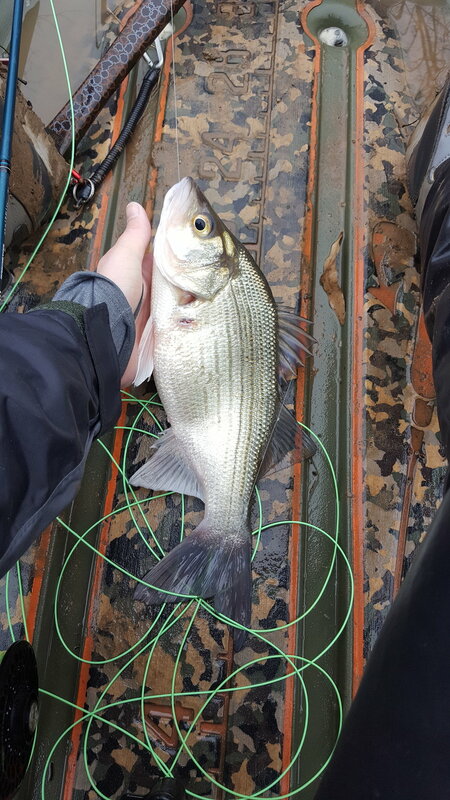 Look for the crappie getting shallow on structure and white bass going up the creeks with decent flows(over 30cfs). Look for the Bass to start getting more active and shallower this next month along with the bowfin. Ill probably start doing LC trips again mid March or so depending on water clarity. As you can see there’s a lot to look forward to in Texas in the next few months before the scorching heat takes over. Lets go fly fishing!! !